Imagine a bad TV sitcom that lasts an hour and a half and which has raunchy language in it. 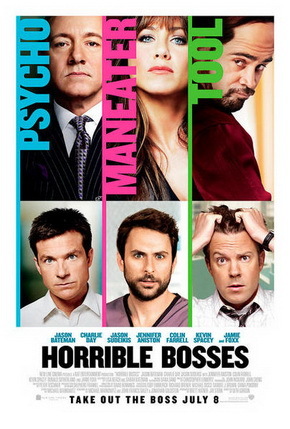 That’s pretty much what Horrible Bosses is like. Nick (Jason Bateman) has a sadistic boss, Dave Harken (Kevin Spacey), who likes to play mind games with people. Dale (Charlie Day) is a dental assistant whose boss, Julia Harris (Jennifer Aniston) is continually coming on to him and tries to blackmail him. Kurt (Jason Sudeikis) is a chemical company executive who gets along with his boss (Donald Sutherland). However, when the latter dies, the company is taken over by his obnoxious cokehead son, Bobby Pellitt (Colin Farrell). Nick, Dale and Kurt like to get to together at a bar and commiserate with one another. They are so desperate that they decide to kill their bosses. They hire a “murder consultant”, Jones (Jamie Foxx), to help them. One of the reasons I went to see this film is because Roger Ebert gave it three and a half stars. Perhaps I should ask Ebert to reimburse me for the cost of my ticket. This entry was posted on July 11, 2011 at 7:05 am and is filed under Cinema. You can follow any responses to this entry through the RSS 2.0 feed. You can leave a response, or trackback from your own site.